This is a speech delivered by Education CS Amina Mohamed on the end of KCSE 2018 Exams, the day the exams will be released and what they learnt. This morning, the national monitoring team comprising of officers from the Ministry of Education, Teachers Service Commission and Kenya National Examinations Council (KNEC) visited a number of schools in Nairobi County to supervise the final Kenya Certificate of Secondary Education (KCSE) examinations. This team has converged here, at Nairobi School, where we have just witnessed the sealing of the Arts and Design Practical answer scripts. This effectively marks the successful completion of the 2018 KCSE sat by 664,550 registered candidates. I wish to acknowledge and most sincerely thank this top notch team of professionals including Basic Education PS, Dr. Belio Kipsang, Prof. George Magoha (KNEC Chairman), Dr. Nancy Macharia (TSC, CEO) and Dr. Mercy Karogo (KNEC Acting CEO) for executing one of the most robust examination monitoring exercises ever undertaken not only in our country but on our continent if not the World. This, coupled with the high level multi-sectoral team of monitors, ensured that the country witnessed the most credible KCSE in the examination’s 29-year history. In fact we already have several requests for bench marking because very much like us, they wish to guarantee the credibility of their matriculation processes. I am extremely proud to have led such a high powered and focused team whose tireless and selfless dedication has once again guaranteed the security and future of our country. I also wish to acknowledge and appreciate a majority of candidates who prepared well and brought determination , enthusiasm and foresight to the examination halls. I am proud to be associated with these great young men and women who have proved ready to take on and surmount the challenges of the future and make their contribution to our national journey. As a Country we should fully satisfied to have achieved this outcome , at a time when mobile and internet technologies offer many advanced methods of relaying information and amid a society some of whose members will go to any length to compromise standards, ethos, values and norms. So this was a massive undertaking that was not easy. It’s been said before that the roots of education are bitter but the fruit is sweet. The faces of our 2018 KCPE candidates confirmed and validated our efforts. More than 98 per cent of contracted professionals and school teachers displayed unparalleled commitment to the administration of the high integrity examinations. In all the 459 sub-Counties that the monitoring teams visited, there was massive evidence that officials recruited from relevant government departments for the exercise served with a high level of commitment and intent to safeguard the integrity of the process. All the stringent measures issued to guide the administration of the 2018 examinations were enforced in 99 per cent of the centers. Mishaps reported in a small number of schools were swiftly dealt with in a manner that did not compromise the smooth delivery of the examinations. In the 222 schools that were put under high surveillance based on previous history of malpractices, examinations went on unhindered in 220 of these centers. Minimal malpractices were detected in two of the centers, with the alert monitors taking remedial action that prevented any full blown collusion or examination contamination at the centers. Officials in charge of 10 centers were relieved of their various duties as center managers for allowing the transportation of examination materials in private vehicles contrary to the requirement that only government transportation be used for the purpose. Others were replaced as center Managers for allowing unauthorized persons into the school compound during the examination period. A total of 110 people, including candidates, who attempted cheating during the examinations were arrested owing to the watchful eyes of security-men, monitors and other examination officials. At least 10 Board of Management teachers in four schools were arrested in connection with various cases of examination malpractices. These teachers have been arraigned in court. A total of 101 cell phones confiscated from teachers, candidates and school staff are with security agencies as investigations continue into attempts to use the gadgets to relay information into examination rooms. Four students were de-registered for impersonation. The successful completion of the examination process would not have been possible without the combined vigilance of the ministries of Education, Interior, ICT, contracted professionals and surveillance monitors. The Ministry hopes to build on the gains made and lessons learnt during the 2018 KCPE and KCSE examinations administration to improve the process and systems next year. 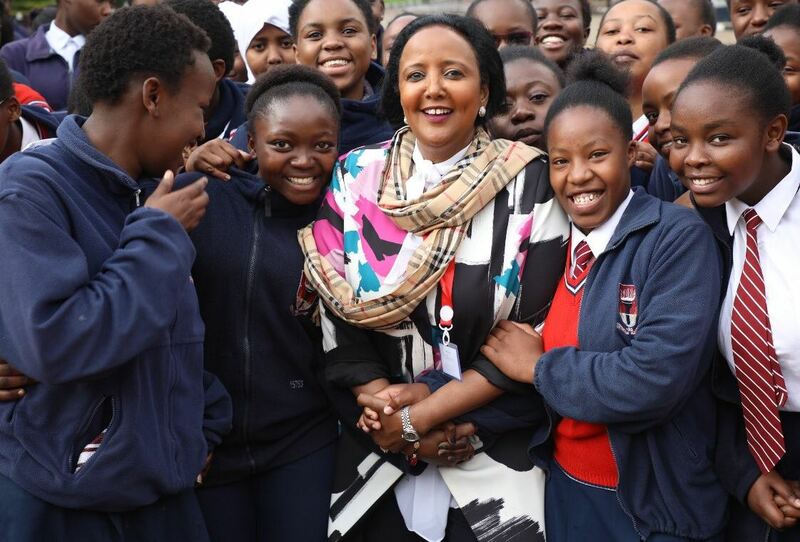 Although not part of her statement, she indicated that KCSE Results will be released before Christmas 2018. What we all require is just and fair results that we have worked for the last four year..